Since the Tumblr page Texts from Hillary (TFH) premiered in 2012, Hillary Clinton fans haven't been able to get enough of a good Hillz meme. 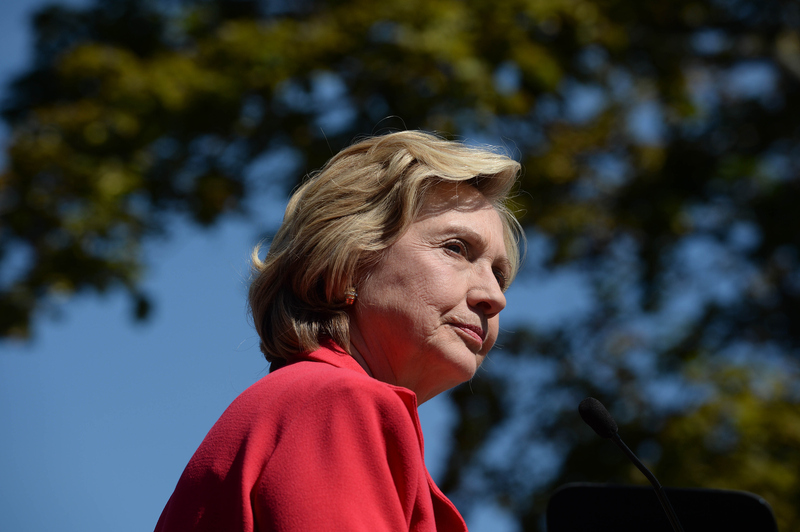 Who doesn't think of TIME photographer Diana Walker's iconic image of sunglass-clad Hillary when they think of HRC? And now, the Hillary Clinton memes have far surpassed what TFH co-creators Stacy Lambe and Adam Smith might have ever imagined. 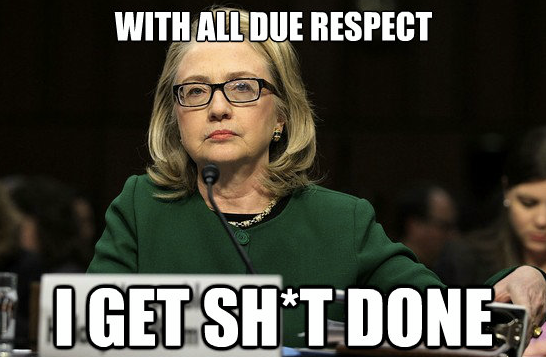 There are several Hillary Clinton memes to keep close at hand as we rev up to 2016 — the below are just a few. As Walker said in a 2014 interview, Clinton has always been accessible to the public via the camera lens and takes the time to play it up for the camera, despite her busy day. She wears me out! But it’s the most wonderful wearing out. She’s totally focused. But even with that laser focus, she has time to be funny and charming. And when she gets the chance, Hillz knows how to work the camera magic. She's become quite the selfie queen and has jumped in front of the lens with more than just a few famous faces. Kim K., Meryl Streep (#bffgoals), Nancy Pelosi and more have been the subject of a good old fashioned H. Clinton iPhone selfie. 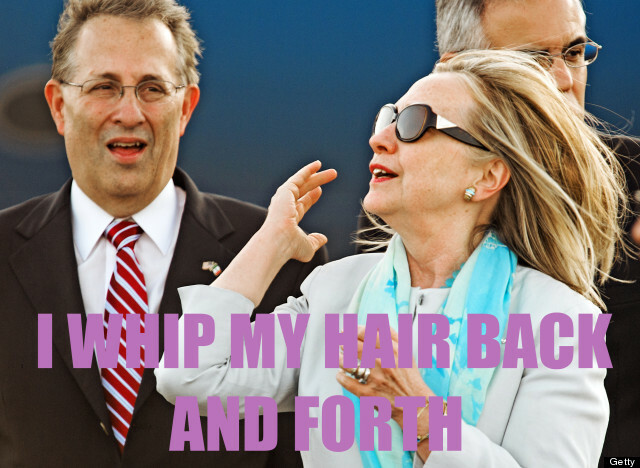 Although Hillz has created some photog bliss of her own, her meme fame is at a fantastic peak. She keeps the cameras, and the computer mouses literally clicking. And some of these memes bring the ultimate caption game. So, cue the sarcasm, hair flips, and shades. Let's roll out some HRC memes to keep us smiling all the way to the primaries and beyond. And the Texts from Hillary website certainly wasn't meant to only be around for that short period in 2012. No, it shall live on forever in our hearts and minds, and on our phones as we gear up for 2016. Let's revisit HRC and some of her biggest meme pals, Joe Biden, Ariana Huffington, Anna Wintour, and remember that the Hillary humor cannot and will not end. A meme-worthy candidate makes for a fun-loving candidate. When Beyoncé Voters came onto the scene in the summer of 2014, political meme fanatics went a little nuts, and justifiably so. These memes, which became cover photos and gifs, most definitely featured some of the best Hillary moments on record. And these memes also featured Beyoncé lyrics, so, to quote Kurt Vonnegut's Slaughterhouse Five, "everything was beautiful and nothing hurt." Oh, Hillary, I love you and your meme-worthy life, smile, and style. Keep up the charm for 2016, because no one can top you in the meme department.